A tantalizing assortment of mouth-watering confectioneries, frosting draped cupcakes, bakery-fresh macaroons, and pretty floral accents await to be arranged into pleasing decorative displays on handmade greeting cards, scrapbook layouts, and celebratory heirloom albums! With the Sweet Shoppe Treats Cling Stamp Set, whipping up your own hand stamped backgrounds or repeating borders is as easy as a boxed cake mix! For an extra special treat, pair with the coordinating dies to “bake” up decadent, dimensional “homemade” embellishments! 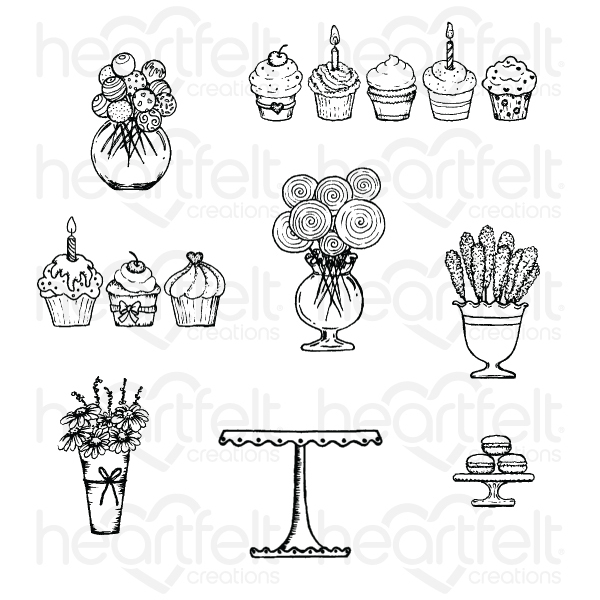 This cling stamp set is part of the Sugarspun Collection and pairs with the Sweet Shoppe Treats Die.